History basketball begins later emergence of basketball. Initially, the game of basketball used regular football, but eventually started playing basketball special balls. 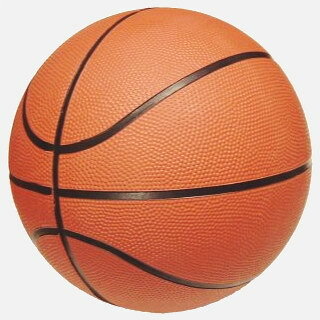 The first basketball was sewn with several pieces of skin, and it was located inside the air chamber and that the ball had laces, like a rugby ball. This ball was a little more modern basketball, he made a circle about 84 cm., While the Now playing basketball balls circumference 75-80 cm. This ball had severely rounded, so it was a bit difficult to play. Although at the time it was not required as dribbling is not used, and could move the ball through the gears from player to player. The problem was also that after each quarter of a basketball pidkachuvaty had previously solving lacing. There are two versions explaining why modern orange basketballs. One of them is connected with the first balls. The color of the skin, which made these balls, little dark brownish-orange color, so color and modern - a commitment to tradition. The second version says so. By the mid 50-ies basketballs were dark brown. But in 1957 the rules were amended to oblige game balls used in natural color - yellow-brown or yellow by mutual agreement of the teams. This did not suit Paul Hinckley, coach Batlerskoho University. He wanted the basketball was readily visible to all - and spectators and players, and in 1958 in cooperation with the firm Spalding was released orange ball that pleased everyone. Already in 1959 orange ball was listed in rules and yellow thence removed, leaving the natural yellow-brown color as optional. But he soon disappeared from the rules of the game of basketball.